Our new range of nine floral inspired colours in flower paste and modelling range from Renshaw are perfect for creating beautiful sugar flowers for wedding cakes and celebration cakes. If you are making edible flowers for a wedding cake or models for a special birthday cake you’ll want to choose the best possible ingredients and this new range of Renshaw florist paste is available in a fantastic range of bright floral shades perfect for beginners or advanced cake decorators. 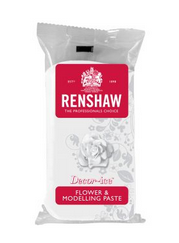 Renshaw Flower and Modelling Paste comes in a 250g block, which should be ample for most projects and before you know it you’ll be crafting delicate pink roses, elegant butterflies and anything you can possibly imagine. This flower paste can be dusted with shimmer for a sparkling sheen and even painted with edible colours to create quite original effects. The consistency of this flower paste also means that it works well with plunger cutters, which can make the creation of petals and flowers a little easier for the less dextrous among us. Making bigger models is easy too. Just mix it up 50:50 with sugarpaste and you’ll be able to craft animals, people, whatever you can imagine. Once combined with sugarpaste, the setting properties of the final paste will ensure that whatever you make will keep its shape more readily than simply using sugarpaste on its own. Available form our Cake Decorating Shop in Knowle, Solihull, Birmingham.